Since most are biennial, propagating campanula plants, or bellflowers, is often required in order to enjoy their blooms each year. Although the plants may readily self-seed in some areas, many people simply choose to collect seeds for campanula propagation their selves. Of course, they can also be propagated through transplanting or division. Growing campanula from seed is easy; but if you’re planting seeds for campanula propagation, you’ll need to do so at least eight to ten weeks prior to spring. Since the seeds are so small, they barely need covering. Simply sprinkle them over a seed-starting tray filled with moist peat or potting mix (with about three seeds per cell) and cover them lightly. Then place the tray in a warm location (65-70 F./18-21 C.) with plenty of sun and keep it moist. You can also scatter the seeds directly into the garden and gently rake some soil over them. Within about two to three weeks, campanula sprouts should appear. Once they reach about 4 inches tall, you can begin transplanting the campanula seedlings into the garden or larger, individual pots. 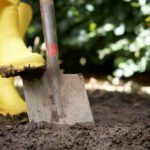 Make sure they have well-draining soil in a fairly sunny location. When planting, make the hole large enough to accommodate the seedling but not too deep, as the top portion of the roots should remain at ground level. Water well after planting. Note: The seedlings normally don’t bloom during their first year. You can also propagate campanula through division. This is usually done in spring once new growth appears. Dig at least 8 inches from the plant all the way around and gently lift the clump from the ground. Use your hands, a knife, or spade shovel to pull or cut apart the plant into two or more rooted sections. Replant these elsewhere at the same depth and in similar growing conditions. Water thoroughly after planting.